Strategic information on the HIV epidemic and national responses to it, generated through the collection, analysis and dissemination of epidemiological surveillance and programmatic response data, is vital to inform policy and programmatic planning, including resource allocation, targeted prevention efforts and the cascade of interventions along the continuum of care for people living with HIV. 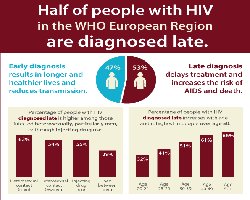 HIV strategic information is a key priority area for the HIV/AIDS, STIs and Viral Hepatitis (HSV) Programme of the WHO Regional Office for Europe. joint UNAIDS/WHO/UNICEF annual Global AIDS Response Progress Reporting (GARPR) and reporting on the progress towards universal access to HIV prevention, treatment and care in the health sector. ECDC and the WHO Regional Office for Europe have been jointly coordinating the surveillance of HIV and AIDS in Europe since January 2008 and work closely together to ensure that high quality and timely HIV/AIDS surveillance data are collected from the 53 WHO European Member States on an annual basis and made available to the public. The data are collected and stored in a joint ECDC/WHO database for HIV/AIDS surveillance hosted in The European Surveillance System (TESSy) at ECDC. Under the framework of joint surveillance, annual HIV/AIDS surveillance in Europe reports are published each year on the occasion of World AIDS Day (1 December) and regular meetings of the European Network for HIV/AIDS surveillance are conveyed. The global monitoring and reporting on country responses to HIV is coordinated jointly by WHO and UNICEF Headquarters and the UNAIDS Secretariat with the support of the regional and country offices. Data are collected through an online reporting tool for all indicators with harmonized validation process, guidance and timelines across agencies. UNAIDS/WHO produce global, regional and country specific estimates of the burden of HIV infection on a regular basis. The methods and assumptions used to produce HIV estimates are continuously improved based on increased knowledge of the HIV epidemic and its dynamics in different populations under overall guidance and recommendations of the UNAIDS Reference Group on Estimates, Modelling and Projections.